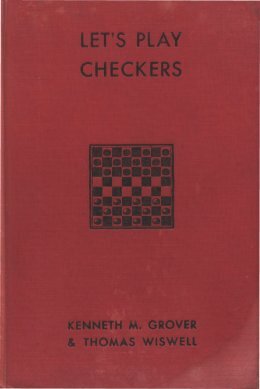 It's been a long time coming, but thanks to the kind approval of the Grover estate, we're at long last able to offer a new electronic edition of the Ken Grover and Tom Wiswell classic, Let's Play Checkers. This book, originally published back in 1940, went through a number of editions, most of them during wartime. The copies have not fared well. Wartime paper restrictions limited the quality and especially the durability of the books, and although used copies can still be had, they vary greatly as to their condition. Our new edition features modern typography and clear, crisp board diagrams, while still retaining all of the wonderful content and "feel" of the original. Let's Play Checkers was not your typical checker book. Though it did have the usual "Game Section" and "Problem Section" structure common to nearly all books of the time, the emphasis was decidedly different. 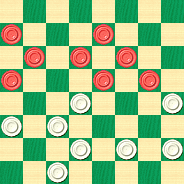 Let's Play Checkers is an opening repertoire book for the go-as-you-please (GAYP) player. Repertoire books, which feature detailed study of just a few suggested game openings, are common in chess but most rare in checkers. Let's Play Checkers' repertoire approach will appeal to the intermediate GAYP player, while its sparkling collection of 100 problems will attract players of every skill level. Here's an example, composed by co-author Ken Grover. This is a book you'll definitely want, even if you already have a print copy, and it's yours for the taking, completely free of charge. You can download it here. So what are you waiting for? Download the book and look at the solution to Problem No. 100!